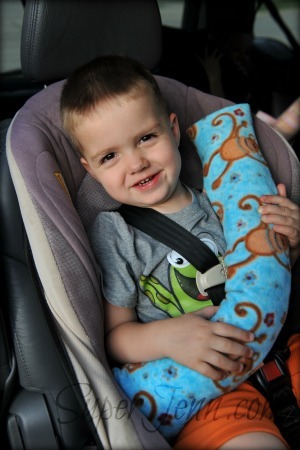 Have you ever had a little fall asleep in their car seat and wonder how the poor little one could bend their neck that way? Super Jen has a solution for this problem; seatbelt pillows. So break out your sewing machines and follow her instructions and save those little necks. This tutorial by Abby Glassenberg can be found on Sew Mama Sew. What a cute gift this would make for a little one. 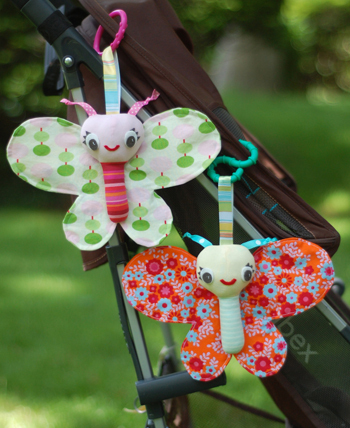 It is soft, makes noise, easy for small hands to hang on to and can be made from scraps you may have on hand. Polymer Clay Web brings you this tutorial on how to make beads look like opal. The results are wonderful. It takes a few supplies to get it done, but you can’t argue with the results. School is almost out for summer. 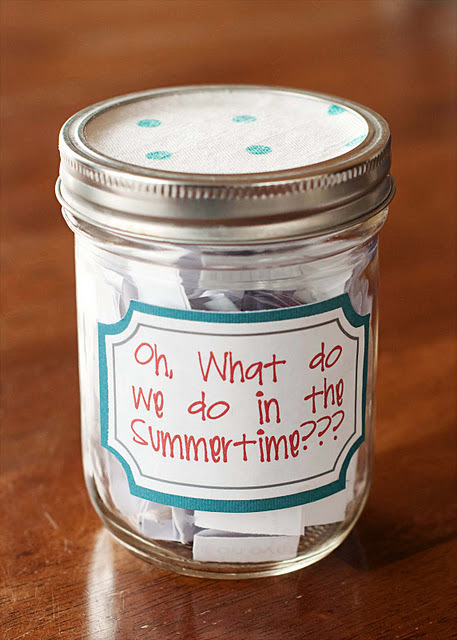 Here is an activity jar idea from Over The Big Moon. She has a lot of ideas for keeping little ones busy, I find them inspirational and got me to thinking of some that would work for my young friends. 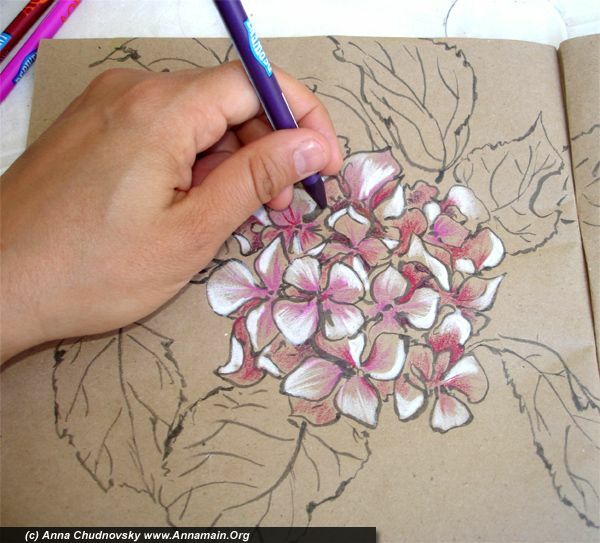 This is a great tutorial by Annamain on how to draw and color hydrangea. She has great pictures of the different steps and I find it pretty easy to follow. I have been working on a quilt for my niece that recently graduated from college. I took a picture and did some manipulation in photo shop and blew it up to the size I wanted for my quilt. I made two copies. I took a permanent marker and traced around the areas that I want to do in different shades of gray and the facial features that would be cut out of material. Then I labeled and cut these pieces out of one of the copies. I used wonder-under on all of the fabric that I want to become the face. Cut the fabric pieces and arranged them on the backing fabric using my extra copy as a guide. When I had everything in place I followed the instructions on the wonder-under and pressed the fabric pieces in place. Then I layered the top fabric, batting and back fabric together, pinned and free-form quilted the face. I used a quilt as you go method to finish the rest of the quilt. I am pretty happy with the results and would give it a try again. 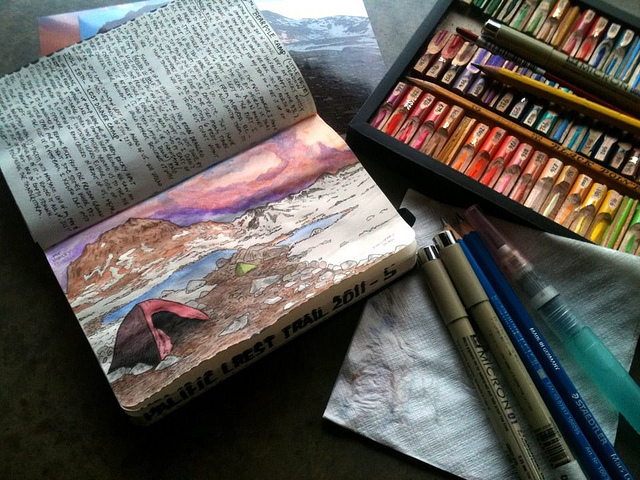 If you travel at all and like to do watercolors here is a helpful idea from The Hiking Guy. This will come in handy this summer and maybe I will get more painting done. One of my goals for this year.